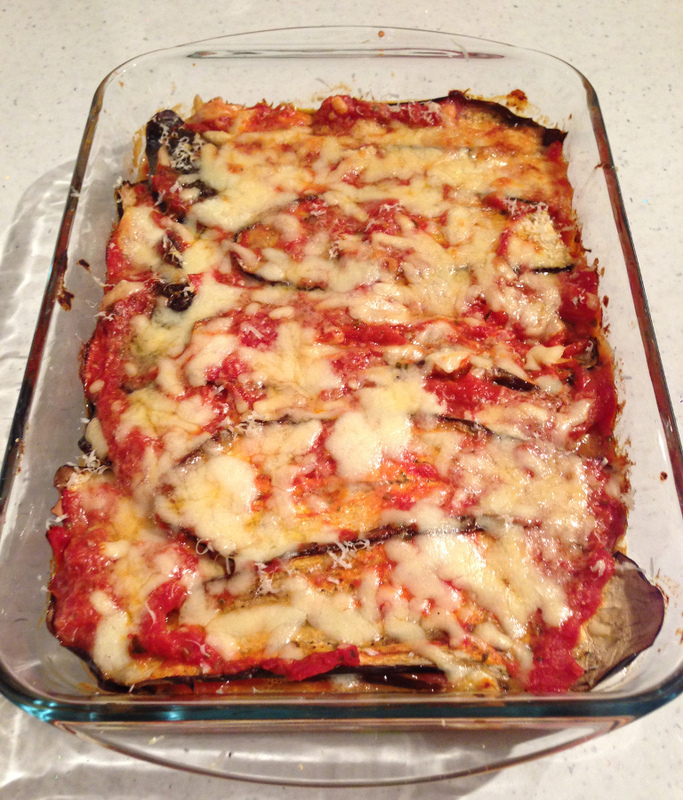 Aubergine parmigiana is a traditional dish from Southern Italy (it’s not clear if it’s from Naples or from Sicily), made with layers of aubergines, tomato sauce and cheese. Traditionally the aubergines are deep fried, but I prefer a quicker (and lighter) version with oven cooked aubergines. For this recipe you need to use real mozzarella; the one that comes shaped balls and is packed with water to keep it fresh and moist. Serves 4 as a main course, 6 as a second course or starter. Heat the oven to 180 °C. Usually aubergines are not peeled, but sometimes the skin is a bit tough, so it’s your choice whether to peel them or not. Cut the aubergines lengthwise into slices ½cm thick. Put some foil on the oven tray, drizzle some olive oil on it (so the aubergines won’t stick) and place the aubergine slices on it. Probably the aubergines won’t fit in a single tray, so repeat with another tray or with the wire shelf. Bake the aubergines for 30 to 35 minutes until soft, turning once during the cooking time. In the meantime, heat up a couple of tablespoons of olive oil in a pan with the finely chopped garlic. When it starts sizzling, add the tomatoes, the shredded basil, some salt and some pepper. Bring back to a boil and cook uncovered (or partially covered to avoid splatters) for 25 to 30 minutes, until quite thick. When the aubergines and the sauce are both ready, you can start assembling the dish. First of all, drain the mozzarella balls and chop them in small pieces. Spread a couple of spoons of the sauce on the bottom of an oven safe rectangular dish (I use a 35x23cm pyrex dish). Cover with a layer of aubergines; you should use about a third. Spread one third of the tomato sauce on the aubergines and cover with one third of the mozzarella. Repeat for other two layers. If you used a differently sized tray you could end up with more or fewer layers, but it doesn’t matter for the final result. Spread the grated Parmigiano cheese on top of the dish. You can now bake the parmigiana or keep it in the fridge until needed; it will last for a couple of days. Bake the parmigiana in a preheated oven at 180 °C for 30 minutes. Leftovers can be reheat in the oven for 20 minutes or in a microwave until hot. Alternative version with fried aubergines. Cut the aubergines in the same way as in the original recipe. Heat up quite a bit of frying oil (sunflower oil for instance) in a pan. When hot, fry a few aubergines at a time until golden on both sides and soft. Dry the aubergines with some paper towels to absorb the excess oil. Make the sauce and assemble the dish as in the original version. This entry was posted in main courses, second courses, starters and tagged aubergine, eggplant, mozzarella, naples, napoli, parmesan, parmigiano, sicily, tomato sauce, tomatoes by Marco Barisione. Bookmark the permalink.